The exotic pet epidemic in the United States is overwhelming. There have been hundreds of tragic and often fatal incidents between owners and their exotic pets. Whether these animals reside in homes or in backyard menageries, the dream of owning a wild animal and raising it is short lived for many. No matter how hard a person tries to replicate a wild animal’s natural environment, they will always fall short. Owners realize fairly quickly that the animal they’ve purchased (usually through the illegal wildlife trade) isn’t manageable. Sadly, this often leads people to abandon, release, euthanize or – in the best case scenario – surrender their exotic animals to sanctuaries. For some, releasing their pets into the wild seems the most “viable” option. Although some owners who take this course may have good intentions, releasing exotic animals into the wild is cruel, not to mention illegal. Having been raised by humans, these animals have little to no survival skills and succumb to the harsh elements that are foreign to them. They often wind up dying from exhaustion and starvation while others get hit by vehicles or killed by predators. In rare cases, the animal survives; when these exotic pets establish themselves in non-native ecosystems, they become known as an invasive species. According to the National Invasive Species Information Center (NISIC), an invasive species can be any non-native plant, animal or pathogen that establishes itself in the surrounding ecosystem. While this may seem like a “good” alternative to the other unfortunate fates former-exotic pets might meet, it can have serious implications for the greater ecosystem. Exotic pets that do survive release and establish themselves will inevitably interfere with or disrupt the surrounding ecosystem. Many non-native species that begin to colonize an area compete for resources with native species and depending on their size, prey on them. In many cases, invasive species that establish their dominance in an area can have irreversible effects on the local habitat. In addition to damaging balanced ecosystems, invasive species also harbor foreign disease and can become public safety hazards. Florida is currently a hotbed for invasive species. The adaptable climate and vastness of the Everglades has allowed for a number of non-native species that were previously kept as pets to easily acclimate to the environment. Here are a few examples of exotic pets that have become invasive species in this temperate state. The Burmese python, one of the largest snakes in the world, has been an invasive species in Florida since the 1980s. It’s strongly believed these snakes were once kept as household pets but were released into the wild when they became too big to handle. On average, Burmese Pythons found in Florida reach between 6-9 feet long – understandably larger than what your average pet caretaker might like. Yet, this does not deter misinformed consumers from purchasing these exotic animals as pets. 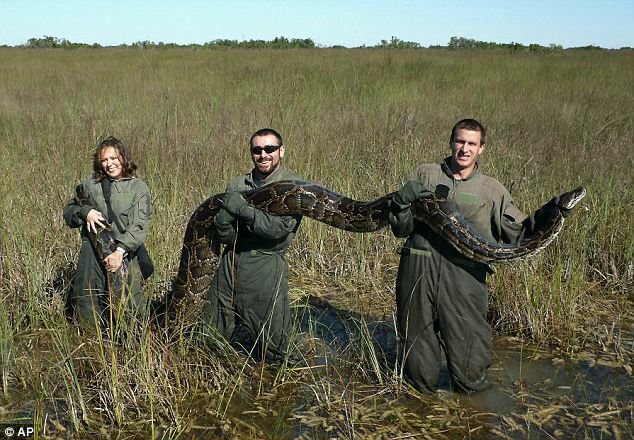 Since 2002, over 2,000 Burmese pythons have been removed from the Everglades National Park. Researchers believe the pythons are responsible for a decline in the bobcat, rabbit and opossum populations. According to the Fish and Wildlife Service, the Red Lionfish has been a direct threat to native saltwater fish in Florida since the late 1980s. It is believed that the root of today’s Lionfish infestation in the Atlantic Ocean resulted from an accidental release of six fish from an aquarium in 1992. Since then, it is believed that numerous Lionfish have been purposely released by “retired aquarium enthusiasts.” Today, Red Lionfish have been recorded off the coast of South Florida, all the way up to Georgia, South Carolina, and North Carolina. Lionfish are voracious predators that pose a serious threat to biodiversity across coral reef regions. In these delicate ecosystems, the introduction of Lionfish can cause a full-scale collapse as Lionfish do not have any natural predators. First recorded in 1966, the Green Iguana has been established in Florida for at least 10 years with a number of breeding populations. The Green Iguanas aren’t suspected of competing with native species for food, as they have a vegetarian diet, but they are responsible for destroying lawns and parks. Many individuals don’t survive the winters in southern Florida, but those that do can grow to be six feet long. Considered a nuisance by some residents and a public safety hazard by others, when the Green Iguana feels threatened, they can become aggressive. Stories of invasive monkey species that have taken over parks and green spaces are nothing new to many Florida residents. In many cases, the booming wild monkey population has become a major tourism draw. Unfortunately, these monkeys can harbor zoonotic diseases which can be passed to humans. By Florida official’s estimates, at least 700 captured Rhesus Macaques tested positive for the herpes-B virus in the past decade. It is believed that many of these monkeys were released into the wild after the film “Tarzan” increased the public’s fascination with pet monkeys in the 1930s. Since then, the number of non-native monkey species, many of which are popular exotic pets, has increased exponentially across the state. A year-long study in the Everglades found that the invasive Cuban Tree Frog has severely impacted the population of native tree frogs in Florida. These aggressive frogs prey on native species and compete with them for habitat. Although many of the invasive frog species in Florida may have initially been introduced after being trapped inside shipping containers brought into the states, researchers believe that the high release rate of exotic pets in the 1980s now accounts for over 80 percent of introductions. While more awareness must be brought to the plight of the animals suffering from being captured bred or sold through the exotic pet trade, the negative impact these non-native species can have on the environment upon release is also of major concern. The bottom line is that these animals never belonged as pets to begin with, but irresponsible caretakers who release these pets into the wild only add insult to injury. Ending the invasive species problem starts with raising awareness for the exotic pet epidemic. Although it might seem “cool” or “unique” to own an exotic pet, when you look at the far reaching consequences that buying one of these animals can have, it hardly seems worth it. You do realize that "domestic" cats are more destructive than any other invasive species brought to the United States right? They kill more native wildlife than all other exotic species of animals combined. Why aren\’t cats on your little list here? Oh, your article is factually incorrect. The invasion of Burmese pythons were not caused by irresponsible pet owners, the culprit was an open air breeding and importation facility that was destroyed in Hurricane Andrew. All the Burmese pythons recovered since that time have been DNA linked to that facility. Please stop your fear mongering and spreading of lies and myth. If you can\’t be honest in your stance, your cause is questionable. Domestic cats aren\’t an invasive species, and that was the point of the article. Also, it\’s a belief that some burmese pythons were released because of hurricane andrew, not fact. it\’s also strongly believed that many were released into the wild that had previously been pets. How is that fear mongering? Maybe you should do some more research…. Domestic cats fall within the same category as exotic pets. They are an introduced species in the US. Unlike most other exotic species however, they have established wild/feral populations in all of the lower 48 states and have done more damage to native wildlife than any of the species listed in the article this discussion is on.